On November 14th, Asia Blockchain Review is delighted to host its second “Unblock Kuala Lumpur” meetup in Malaysia. Featuring keynote speakers from University of Malaya, Bitcoin Malaysia, Universiti Teknologi Malaysia, and Infinito, the event will cover blockchain through diverse angles such as legal-tech research and educational practices. From the University of Malaya, Nur Husna Zakaria, who teaches graduate and undergraduate courses in Corporate & Competition Law, will share about QRCube Project, the industry-academia collaboration on RegTech research. Jack Nguyen is Project Director of Infinito. With more than 10 years of professional experience in the industry, he is sure to bring worldly insight into blockchain technology. Besides, he will also share about the Infinito blockchain education program and feature in the panel discussion on how innovation and education will converge with the rise of blockchain technology. 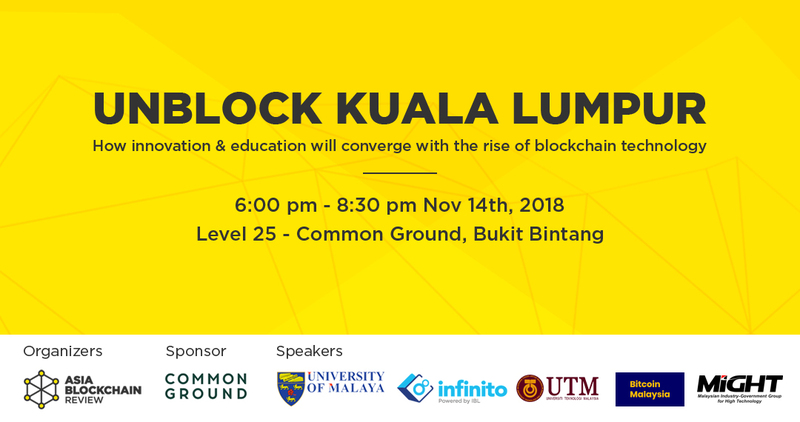 Building off the discussion on blockchain education and training will be Syahrul Azrai, He is a member of BitcoinMalaysia.com which leads the public awareness session via The Blockchain Train Series around Kuala Lumpur City. In the session, he will share details about his current work on a blockchain training program. He will also join the panel discussion to talk about how blockchain and education can benefit from each other. From the Universiti Teknologi Malaysia, Prof Dr Salwani Mohd Daud, who currently teaches blockchain technology and cryptography for the master program, will also be one of the panelists. She will bring interesting insights to the panel discussion on blockchain and education convergence. We hope to see you on November 14th, at Common Ground Bukit Bintang, Kuala Lumpur for some engaging and in-depth discussions as well as networking with fellow professionals. If you can’t make it to this event, stay tuned for our next meetup in this “Unblock Kuala Lumpur” series.